Roulette was invented during the 18th century in France, and over the past more than 250 years, its popularity has grown tremendously. Today, you’ll find roulette tables at casinos all around the globe. In fact, nearly all casinos that offer table games in North America, Europe and Asia typically have at least one roulette table. Avid players in many parts of the world don’t even have to leave their homes to try their luck with the roulette wheel; online roulette games make it possible to play anywhere. Although roulette is a game of chance, there are still strategies involved at how to win at roulette. The game can take years to fully master because players can place bets in a number of different ways. Although at first, the number of possibilities can be bewildering, tips on how to win at roulette can simplify the game and make it easier for even beginners to be more successful at the tables. Truly, the more that you know about how to win at roulette, the more likely you are to win regularly when you step up to the real or virtual tables. One of the most important things to remember with any roulette tips is that in order to become good at playing roulette, you need to practice. Only through actually trying tips out for yourself can you become familiar with the game and comfortable with it. Online roulette is one of the best ways to gain practice because you can play from the comfort of home and not have the stress and distractions of other players around you. Mastering roulette starts with fundamentals; you need to know the basics of the game before you can move on to more advanced tips that those who win frequently use. One of the most important things to understand about roulette is that the game can be played more than one way. Some of the versions of roulette are more popular than others. Generally, most brick and mortar and online casinos feature either European or American roulette. French roulette is a third, less popular variation. If you want to feel comfortable at most real life and virtual tables, you should familiarize yourself with at least European and American roulette. With just a quick glance at a European roulette wheel and an American roulette wheel, you can immediately see what the most obvious difference between the two games is–the wheels have a different design. On an American roulette wheel, you’ll find that there are two green sections: one with a single zero and one with a double zero. By contrast, the European roulette has just one green section, and it is marked with a single zero. The rest of the numbers on the wheels are also positioned differently between the two. The addition of the second set of zeroes to the American roulette wheel means that you are more likely to lose your outside bets when you play the American version of roulette. This is because there are twice the number of chances that the ball will hit a green section. When you play European roulette, it is less likely that the ball will land on a zero because there is only one green square. There is also a difference between what happens to your outside bets if the ball does land on the zero in European roulette. Instead of losing all of your outside bets, you only lose half of your outside bets when the zero is hit. Now, that you know the differences between the wheels and the effects of the zeroes, you can see why one of the fundamental tips for how to win at roulette when you want to play outside chances is to choose a European roulette wheel rather than an American roulette wheel. Some casinos will offer both, and nearly all online casinos have both types available. Another key difference between American and both European and French roulette is the types of bets available. On a French or European roulette wheel, there are distinct sections that players can place bets on during the game. This opens up other possibilities for winning, but it also means that players must learn more about the game and how the different types of bets work. This can be time consuming but by practicing online at European roulette or French roulette, even a beginner can master the section bets with ease. As previously mentioned, the best way to really become good at roulette is to practice often at a time when you can relax and focus. Through our articles, we’ll introduce you to a large number of strategies for winning at roulette. We break down how to succeed with each strategy, but you don’t want to be standing at the roulette table reading an article on your cell phone rather than enjoying the game. When you practice online, you can refer to the strategy as needed and put it to the test. You can continue to use the strategy over and over until it becomes second nature and you no longer have to go back and read how to do it as you play. You’ll have mastered the skill and be ready to learn another strategy. Playing roulette online means never having to deal with a crowd. 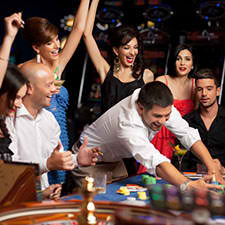 It also usually means having every type of roulette table available to you. Many seasoned roulette players find that they win more often at one type of table over another. Experimenting with online roulette games can help you develop your own style of play and decide which type of wheel you prefer. This way, when you head to the casino, you’ll be as confident as possible and in the best position to succeed at winning.